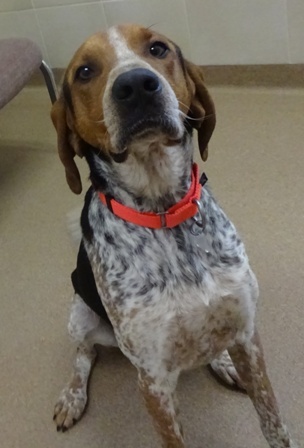 General is a 3 year old, neutered male, Coonhound that weighs 58lbs. General is such a handsome hound! He would love to go to a family that takes him on long walks. He was friendly with another dog his size but might be a little pushy, so he needs to meet other dogs to make sure they get along. We ask that General goes to a kid-free home because he was returned to us for nipping a child when pushed away from food. General has a habit of chasing cars and did tend to wander from from his previous home so he needs an owner willing to train him and keep him safe. Will he be happy in your home?